NMC welding students Andrew DuBois and Michael StolarczykSome NMC welding students are getting a dose of American history on top of this semester’s classes. They’re helping to restore Civil War markers placed on the graves of Union Army veterans in northern Michigan cemeteries. Thanks to an instructor’s idea, the extracurricular project is increasing their skills and their citizenship, one cast iron star at a time. Adjunct electrical instructor Jeff Morse is a member of the Sons of Union Veterans of the Civil War, a national group that works to honor the memory of the soldiers killed between 1861-65. A feature of the Union graves the group charges itself with maintaining is a cast iron star flagholder, inserted into the ground with double spikes. A Civil War marker repaired by NMC welding students“Over the years they became no match to power lawn mowers and brutal northern Michigan winters. Many markers became rusty and either one or both of the spikes had been broken off,” Morse said. He mentioned it to welding instructor Devan DePauw, who agreed to take on repair as an extracurricular project with student volunteers. Students cut off the double legs, grind and prepare the stars for welding, and then weld one spike in a new, center position. It’s an opportunity to learn new techniques from the typical steel-to-steel welding they do in class. “Cast iron is notoriously difficult to weld,” DePauw said. Students are learning a “brazing” technique that uses a bronze filler to weld the spike back on. It’s also an opportunity to apply their knowledge for a greater good. “I like doing stuff that matters. This epitomizes that,” said Michael Stolarczyk, 18, of Traverse City. “I just think it’s a good cause,” said Andrew DuBois, 28, of Flint. Group member Scott Schwander, who has been cleaning the headstones as well, returns the repaired star flagholders to the graves. He started with Oakwood Cemetery near main campus, where about 300 Union veterans are buried. 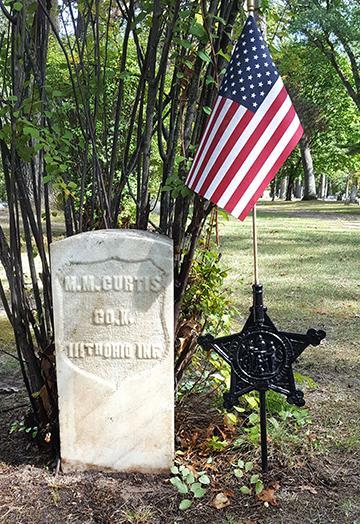 The Robert Finch Camp of which both Schwander and Morse are members serves 16 northern Michigan counties and estimates that more than 1,000 Union veterans are buried in the five-county Grand Traverse region. Camp commander Ted Matti, sees the project as a win–win.